One of the big betting days of the year is upon us with Newmarket's Cambridgeshire handicap over the Rowley Mile along with some very nice pattern races as well. We've got a couple of bets that should see us & you turning a decent profit. The Group 1 Sun Chariot Stakes over the mile is a fascinating affair with the high class & proven Sahpresa trying to win the race for the 3rd year in a row. Standing in Sahpresa's way are the last 2 winners of the Falmouth Stakes in Music Show & Timepiece plus a pair of up & coming 3 year olds from Ireland in Together & Alanza. Music Show started favourite for 2010's 1000 Guineas but she's rarely been able to show her best form & Timepiece has been more of a talking horse than one that does it on the track - her win in the Falmouth was a huge step up on her solid Listed race performances. Aidan O'Brien's filly Together has run to a very creditable level on nearly every start but her overall form figures are uninspiring when it comes to backing her with just 2 wins in 12, she came 2nd over course & distance earlier in the year in the Guineas & finished in the same place in the Irish version behind Misty For Me - at a bigger price than currently available she'd be a good each way proposition. Sahpresa's best performances have come in this race especially in 2009 where she came with a storming late run to beat Ghanaati, last year was a similar story against a weaker field & she's since been kept to Group 1 company, albeit without winning. Sahpresa certainly has a turn of foot but she may have found another that can match & beat that in this race, John Ox has brought just two horses to the UK this year with both winning, his Alanza was one of those & she can keep that 100% record intact. Alanza lost her first two races this year but they were over an inadequate 6 furlongs & since then has won with impressive acceleration, winning two Listed contests & then a Group 3 where she won in a matter of strides, the short distance of victory not reflecting how impressive she was. There is no doubt a lot of improvement to come from her & at the odds available of 7/2 we'll be backing her to make the step up to the big time & win her first Group 1. In the Cambridgeshire itself looks like an excellent renewal with many horses bringing winning form to the race & lots of unexposed sorts. Jeremy Noseda's Dare To Dance looks potentially dangerously well handicapped after winning well off a mark of 86 on just its 3rd run over 10 furlongs over the July course, the Rowley Mile is a very different & difficult test & although Dare To Dance could be up to winning off this mark of 93 it may be too much to ask for this day. Godolphin's Man Of Action won well off of this mark 2 weeks ago & in that time period over half of Bin Suroor's runners have finished in the top 3 places, rider Frankie Dettori would love to get his first win in the race since winning on the best horse to win the Cambridgeshire - Halling. Standing in their way is John Gosden's Questioning, a horse that they have long thought of as a likely type for this race. Questioning hasn't won since its debut but ran very creditably in huge sales races the next 3 times including twice over this course & distance, he disappointed when 1st running in Listed company but ran well last time when narrowly failing to catch the decent King Torus over a furlong shorter. 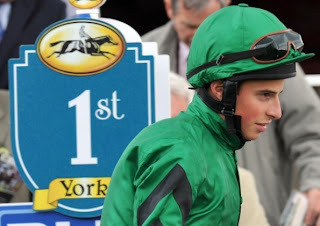 If William Buick can settle Questioning from his middle draw he should get a good tow into the race & can use his lengthy stride to best effect to take the considerable glory.